Where do I use my Euroffice voucher code? Browse NetVoucherCodes to find the best deals and discounts. Click through to the Euroffice website and start shopping. Head to checkout when you’ve finished shopping. Paste your copied coupon code to the box provided on ‘Payment Summary’ and click ‘Apply Coupon’. "Up to 15% off in the special offers section." "Sign up to the newsletter for up to 15% off and a free M&S voucher." 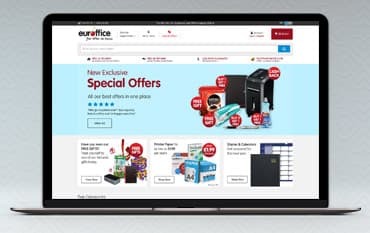 Euroffice is the number one online retailer for stationery and office supplies in the UK. Whatever you need to keep your business or home office running smoothly, you'll find it here. They stock all kinds of office stuff from everyday items to highly specialised equipment from leading brands like Dell.Kodak, Lexmark, Collins, Basildon Bond and more. Shop here for paper products, ink cartridges and toners, office furniture, laptops and tablets, office machinery and so much more, all at unbeatable prices. Shop with them regularly and you can join their rewards programme and collect points with each purchase to spend on a range of treats. Delivery is free with a minimum spend. Using a discount code from Euroffice will give you even better value on your purchase. They release regular codes giving either a discount on select items such as "10% saving on Office Seating " or "10% off Furniture Orders" or offering free gifts with your purchase like " Free Travel Mug when you spend Over £99" or "Free 8Gb USB with a £89 Order" but whether you use a voucher or not, you are guaranteed to get a great price at Euroffice, as they have a price promise so, if you find a lower price online for the same product. they will refund you the difference. There always lots of amazing offers on site and the chance to receive free gifts with your order. Delivery is free with a minimum spend and all returns are free within 14 days. Euroffice, aim to provide you with the cheapest possible printer inks for your office. They stock all the main brands like Epson, HP, Dell, Canon, Brother and much more. So, if you are looking for specific brands like HP ink cartridges, HP 301 ink, Epson ink cartridges or you need colour cartridges of just about any kind, then you re sure to find exactly what you are looking for. You can also make future ordering of printer ink cartridges and toners much easier by saving your printing device in the ‘my account’ area. There is also an online tool that makes it easy to find the correct refill if you know your cartridge type or printer model. Delivery is £4.95 and free on orders over £25. To return a product, you’ll need to contact Euroffice within 14 days of receiving the item. If you contact them more than 14 days after delivery they may be able to accept the goods back, but not at full credit value. How can I contact Euroffice? If you need to contact Euroffice please call 0800 316 3876.